The Christopher brothers have terrorized the Modified racing scene in the Northeast for years. Ted has been a NASCAR National Weekly Racing Series champion; he’s won a bunch of track championships and has a bucket of wins on the NASCAR Modified Tour. Twin brother Mike, on the other hand, has a few track championships and a ton of wins in NASCAR’s Weekly Racing Series Modifieds at places like Stafford Motor Speedway and Thompson Speedway (CT). 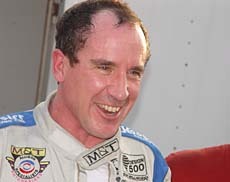 Yet, TC’s accomplishments have overshadowed Mike’s at times and because of that, some have thought he had given up on a shot at a full-time Mod Tour ride. That is far from the truth. Now Mike has the opportunity he has always wanted, a full-time Tour ride with a top-flight team. Mike takes over the #79 Modified ride on NASCAR’s Whelen Northern Modified Tour, just days after team owner Roger Hill and Eddie Flemke split up. The deal between Hill and Christopher was cut Saturday at the inaugural Southern Modified Tour race at Caraway Speedway, where his brother Ted won in the 79-Modified. Mike and Teddy are as tight as brothers can be, but once on track, the gloves are off. At the same time, TC was Mike’s biggest cheerleader while he was trying to get the ride. “A little over a week ago Teddy calls me and tells me he is going to driving the car here (Caraway) and that Eddie is probably going to be out of the car,” explains Mike. “And he said ‘I think they want to talk to you Mike, cause I think they want you to drive the car.’ I said, ‘Wow.’ The next day I got the number from my buddy and I called David (Hill) and told him I was interested in driving the car and he said they would like to do that. Roger Hill has been around Modifieds for a long time, but one thing he has not done is win at New Hampshire International Speedway. Mike runs well there, in fact, he finished second to his brother in July of last year at the Magic Mile, and that might have helped the Hill’s decision making process. Keep in mind though, the season is now less than two weeks away and there’s a lot of work to be done. Then it’s off to New River Valley on Tuesday to test and up to Thompson Speedway for the opening “Icebreaker” event during the weekend (April 9th & 10th). 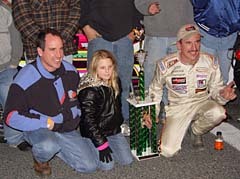 Mike (left) and Teddy (right) pose for pictures after TC's Southern Mod Tour victory Sat. at Caraway. The deal is signed, sealed and delivered: Mike Christopher, the New England native, is now officially a Hillbilly (The name of Hill’s team is Hillbilly Racing). “It doesn’t bother me one bit,” says Mike with a laugh. “Those are great guys and they have a great car. They are really, really nice people; I’m sure we are going to gel. It may take a little while, but we’ll get there. Mike Christopher can be thankful for a lot of things right now; his family, a good business, his brother and a good ride on the Modified Tour. But, he’s also thankful for another thing. The Hill’s are changing their typical pink paint scheme to florescent orange and white this year. See, everything is good in Mike Christopher’s world right now. 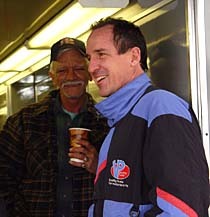 Roger Hill (left) and Mike talk Saturday.